Everyone knows that sleep is very important for maintaining a good physical and mental health. However, the duration of your sleep is just as important as the way in which you sleep. Your sleep position can influence your health, help in keeping your skin look young, and improve your digestive health. 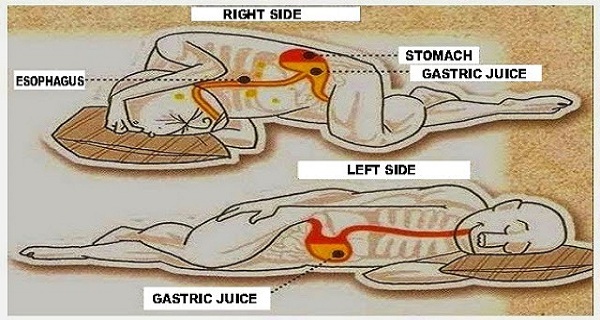 Furthermore, sleeping on the left side of your body can even save your life. If you are currently sleeping in another position, keep reading to find out why you should start sleeping on your left side right now. There are several sleeping positions – your front, your back, your left side, and your right side – and they all affect your health. Sleeping on the back can be particularly dangerous for people with sleep apnea or asthma, because it can cause breathing difficulties. Sleeping on the left side is believed to greatly improve the health and even save lives. In holistic medicine, the left side of the body is the dominant lymphatic side, and while you’re sleeping on this side, your body will have more time to filter toxins, lymph fluid, and waste through the thoracic duct and the lymph nodes. On the other hand, sleeping on your right side may cause your lymphatic system to run more slowly. You don’t want this to happen, because a lymphatic system that doesn’t run at full efficiency can become incapable of filtering toxins or properly moving lymph fluid throughout the body. This increases your risk of deadly diseases due to the build-up of toxins. When you start sleeping on your left side, you might notice your body becoming more efficient at toxin disposal through waste. This happens because this position improves the digestive system, and allows your body to promptly extract nutrients and dispose toxins. You can try lying on your left side and press a full-length body pillow up against your back. The pillow will prevent you from rolling over during the night. Try switching the side of the bed you sleep on. This will make it easier for you to flip to your other side and enjoy the same sleeping experience. Another trick is to keep a dim light lit on your right side. Since your body will naturally want to turn away from the light during sleep, it will make it easier for you to sleep on your left side. Try these small changes as soon as you can – they will improve your sleep routine and lead you to a better health.